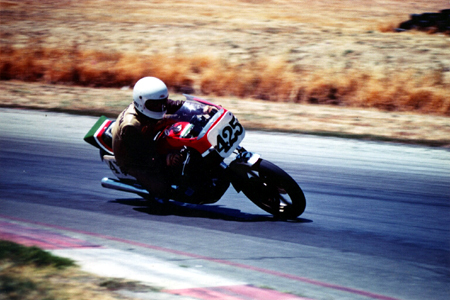 Club racing at Willow, Turn 1 probably 1982 also. Front Straight at Laguna, BOTT 1983. "Steve, You need to ask Kevin for some pictures of his bike from the early 80's when he raced it in BOTT. I used to be a very big fan of his, and I still think the bike in the original SSD clothing, and Italian flag colors, was one of the nicest looking racers around. Too bad there are no audio clips to go with the pictures. 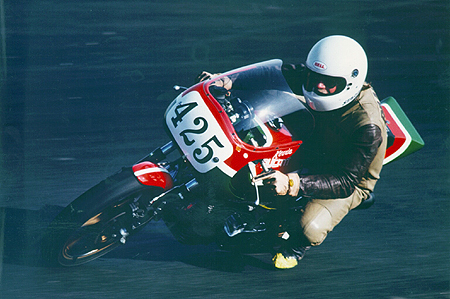 His racers' exhaust note single handedly made me fall in love with Ducati's...."
"In fact, here are a few he recently sent me. Can't tell you how cool that exhaust sounded. If I wasn't so fond of the skin on my legs, I would make a copy for my Darmah!" Tim told me that he sent the pics this morning. After Paul posted I felt a little tentative about sending some of mine. He was so great a racer. I was just a medium fast guy. But what the hell. 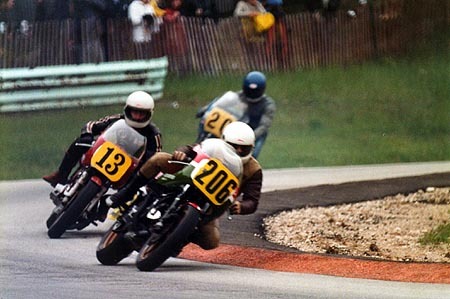 Here's another one of me racing at Elkhart Lake (Road America) in 1982 coming out of Turn 3. I won my class in the AMA BOTT race there and got second overall behind Malcolm Tunstall. 1. Club racing at Sears point, 1982. Turn 6 (Carousel). 2. Club racing at Willow, Turn 1 probably 1982 also. 3. Front Straight at Laguna, BOTT 1983. I can tell because of the Performance Machine brakes. Real stoppers! I broke an ignition coil wire in that race coming into the corkscrew running about 5th place. I was really disappointed because I had finished 3rd overall there in 1982. The basic bike was a Darmah because that was what Jim and I were able to piece together from the various crashed bikes in the shop. Yeah I know it is heavier, but I always thought the seating position was actually better for moving around on. 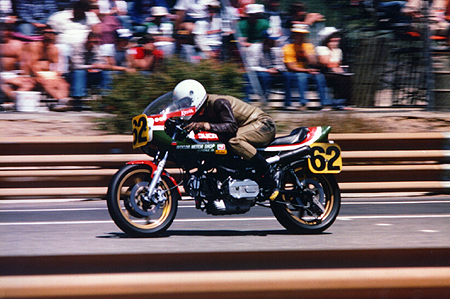 During 1982 the bike had Cosworth pistons, roller crank, Marvic wheels, stock brakes, Bassani megaphones(barely passed AMA sound check), Jim Woods/Axtell heads, Imola cams, stock transmission, Barnett clutch plates, 450 springs. 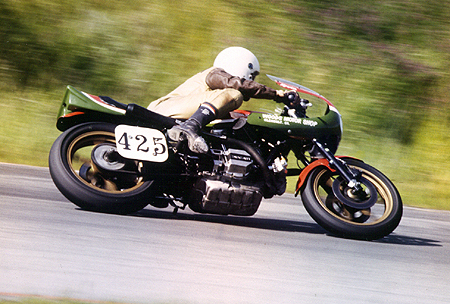 Jim Woods designed the paint layout and painted the bike. He's a creative guy. In '83 we converted to the plain bearing crank from Albert Bajohr in Germany and were running JE pistons and PM brakes and Axtell's megaphones. I like the way the photo gallery is going together. 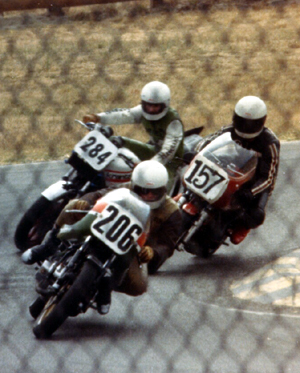 The (above) Turn 11 Laguna shot includes Rich Oliver (Kaw) and Ron Sbordone (Duc) in 1982. Probably was a practice or could have been the superbike race. Don't remember.